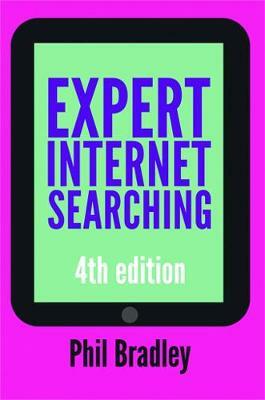 The highly anticipated new edition of Phil Bradley's essential guide to internet search (formerly titled The Advanced Internet Searcher's Handbook) is here. This no-nonsense handbook will give you the tools to find the information that you need more quickly and effectively than ever before. Since the last edition was published internet search has changed dramatically, with both the amount of information to be found online and the diversity of tools to unlock it expanding exponentially. This new edition, rewritten from scratch, gives readers the information and guidance they need to choose the right search tools and strategies for each information need. From searching social media effectively to tracking down an expert or a news story, and from searching by image to searching multimedia, Bradley introduces the best search engines and tools and explains how to get the most out of them. Whether you are a casual searcher or an expert information retriever, you will find information on a wide variety of search engines that you've never tried before and lists of tools and resources that will make you an even better searcher than you already are. Key topics include: An introduction to the internetAn introduction to search enginesThe Google experienceOther free-text search enginesDirectory- and category-based search enginesMulti- and meta-search enginesSocial media search enginesVisual searchingFinding peoplePeople-based resourcesAcademic and other specialized search enginesNews-based search enginesMultimedia search engines Sample searches with hints and tips on better searchingSearch utilities and resources to make life easierThe future of search. Readership: This book will be an invaluable guide for anyone searching the internet for information, whether you are taking your first steps or are becoming more expert. Those teaching others how to search the internet efficiently will find suggestions and strategies and an eloquent rebuttal of the claim that `it's all on Google'.